This instrument is signed by a maker from Trento in Italy and bears the name of the commissioner, Caesar Luchini from Bologna. 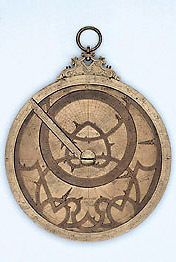 Although the outer parts are engraved in Latin, the inner part of the mater has a wind rose with Dutch names on it, and on the only plate the four names of the winds are engraved in Latin and Greek characters. Also the form of the copper rete, with a heart-shape in the centre, is quite unusual.